Open Enrollment begins a little earlier this year. Seniors will have the opportunity to change their Medicare health or prescription drug coverage for 2013 between October 15 and December 7, 2012.Read more at www.medicare.gov. When spouses have passed on and family lives far away or visits infrequently, the approaching holiday season may not hold much for your senior patients and clients to look forward to. The Be a Santa to a Senior®program provides a way for senior care professionals and community members to help make sure isolated seniors aren't forgotten. A Department of Veterans Affairs benefit may help pay for care at home, in an assisted living facility or nursing home. But most of those eligible for the entitlement are unaware of it. If Bill Clinton added "M.D." after his name, slung a stethoscope around his neck and started visiting the residents in your nursing facility, there's a chance that your residents might start feeling better - however briefly - new research suggests. Caring for seniors is a labor of love that requires a special person with just the right touch. The Home Instead Senior Care®network is looking for dedicated caregivers who share its passion for caregiving to provide non-medical in-home assistance to seniors. Learn more about what it takes to become a Home Instead CAREGiverSMatwww.heartofacaregiver.com. 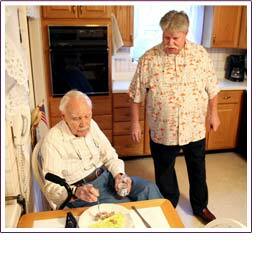 Many seniors, particularly those who live alone, face a number of mealtime challenges. Research conducted for the Home Instead Senior Care®network revealed thatlack of companionshipis the biggest mealtime challenge for seniors. Thecompanionshipof a Home Instead CAREGiverSMduring mealtimes when family members are unavailable can help promote better eating habits and overall health for seniors. Additionally, Home Instead CAREGivers assist with monitoring a senior's diet to ensure it includes healthy foods, meal planning, grocery shopping, meal preparation and meal clean up. Caring too much for your patients sounds like a good problem to have, right? Well there is a difference between providing healthy, compassionate care to your patients and letting the emotional challenges you face every day begin to affect your health. Some of the steps thatCompassionFatigue.orgrecommends you can take to help remain in good health and exercise balanced compassion include: be kind to yourself, enhance your awareness with education, exchange information and feelings with people who can validate you, listen to others who are suffering, express your needs verbally, and take positive action to change your environment. Did someone forward you this email? Sign upto receive your copy of Senior Care Management Insights. Also,sign upto receive our monthly newsletterCaring Connections®, a resource for those who care about seniors. Do you have an article, story or idea you'd like to us to feature in an upcoming issue? Founded in 1994 in Omaha by Lori and Paul Hogan, the Home Instead Senior Care®network is the world's largest provider of non-medical in-home care services for seniors, with more than 950 independently owned and operated franchises providing in excess of 45 million hours of care throughout the United States, Canada, Japan, Portugal, Australia, New Zealand, Ireland, the United Kingdom, Taiwan, Switzerland, Germany, South Korea, Finland, Austria, Italy, Puerto Rico and the Netherlands. Local Home Instead Senior Care offices employ more than 65,000 CAREGiversSMworldwide who provide basic support services — assistance with activities of daily living (ADLs), personal care, medication reminders, meal preparation, light housekeeping, errands, incidental transportation and shopping — which enable seniors to live safely and comfortably in their own homes for as long as possible. In addition, CAREGivers are trained in the network's groundbreaking Alzheimer's Disease or Other Dementias CARE: Changing Aging Through Research and EducationSMProgram to work with seniors who suffer from these conditions. This world class curriculum also is available free to family caregivers online or through local Home Instead Senior Care offices. At Home Instead Senior Care, it's relationship before task, while continuing to provide superior quality service that enhances the lives of seniors everywhere.